Sketching with an Apple Pencil is the merest tip of the iceberg of Apple’s suggestions for making your iPad Pro more productive. Making your iPad Pro more useful is the theme of a series of short videos released today by Apple. Each takes a common task and briefly shows how it can be tackled with a iOS tablet and Apple Pencil. There’re suggestions on creating presentations and podcasts, going paperless, and more. Watch all five videos now. None of the videos in this “A new way” series are how-to guides. They’re more aspirational; by demonstrating that something is possible they encourage watchers to learn more about iPad’s capabilities and available software. 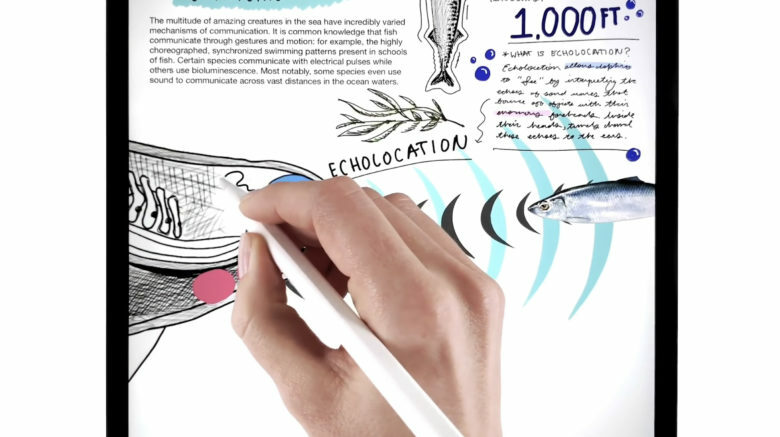 A video called “A new way to take notes” covers three note-taking methods available with this tablet and the Notability app. An external keyboard and the Apple Pencil are involved as handwriting, typing and drawing combine. “A new way to go paperless” covers scanning documents into the iOS slate and adding annotations. The USB-C port in the 2018 iPad Pro allows professional microphones to be used. Apple’s video titled “A new way to host your own podcast” shows that this can be combined with the Anchor app to record and upload a podcast to Apple Podcasts. “A new way to design your space” shows various apps being used to sketch out improvements in a room’s layout.